The Biofinity® toric lens design features now available in a 1-day lens. Our best toric technologies, now in a silicone hydrogel 1-day lens. 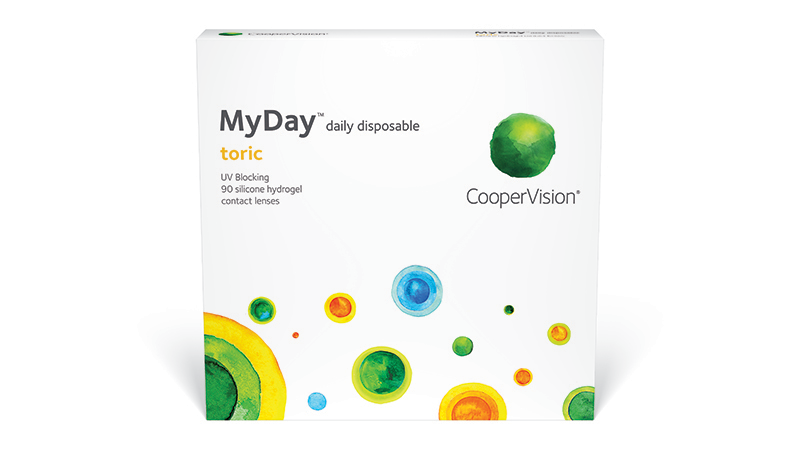 MyDay® toric lenses deliver the consistent centration, stable fit, and excellent visual acuity you and your patients can depend on. Our softest4 silicone hydrogel toric ever. Smart Silicone™ chemistry transports oxygen so efficiently that it requires less raw silicon (only 4.4% content), leaving more space for hydrophilic material. These features deliver the comfort, softness, and easy handling that patients love. 1.Manufacturer stated oxygen transmissibility values (Dk/t): MyDay daily disposable (100), dariti® 1 day (86), 1-DAY ACUVUE® MOIST (25.5), SofLens® daily disposable (24), ‘Compared among CooperVision® silicone hydrogel contact lenses. Data on file. 4. Compared among CooperVision silicone hydrogel contact lenses. Data on file.